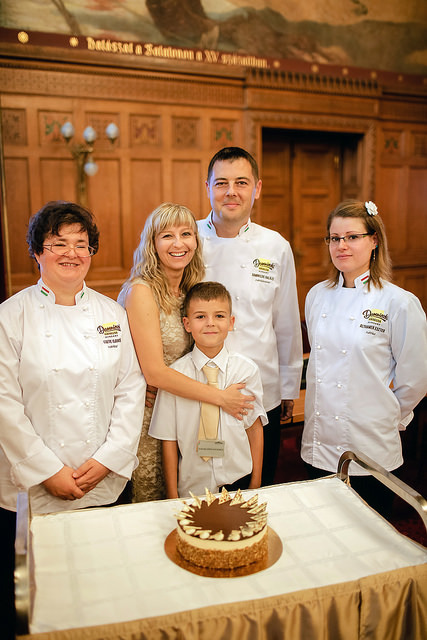 Click here to see the 2012 winners and here to see the 2013 winners! I’m yet to taste these great looking cakes, will update You with photos and comments once I get the chance to grab a slice of each! 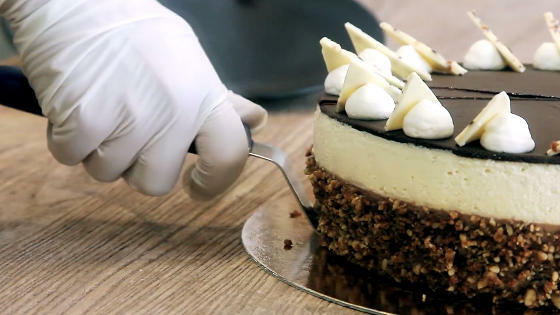 A modern spin on the traditional somlói parfait (one of our dearest favorite desserts), this cake dons a nut brittle sponge layer with a subtle orange drizzle, topped with dark and white chocolate mousse and a ganache – even if some doubt its resemblance to the good old Hungarian somlói I don’t care, it sounds and looks great to me! Oh hey I found a video!! Prepare the nut brittle from the roughly chopped walnuts and sugar. Once cooled, grind it. Separate the eggs, whip the yolks with the sugar, mix with the nut brittle and the flour, then fold in the whipped egg whites. Pour it in the baking pan and sprinkle with chopped walnuts. Bake on 155 C° in slightly steamed oven for 30 minutes. Whip the egg yolks. Heat the cream to 80 C° and slowly pour it into the yolks while stirring continuously. Melt the dark chocolate to 38 C° and add it to the cream-yolk mixture. Cool to 27 C° and mix it with the rum and whipped cream. Mix the sugar with the (dry) gelatin and pectin. Grate the orange rind and squeeze the juice, place the rind in a tea egg. Mix the juice with the pectin-gelatin-sugar mix and let it swell for 5 minutes. Boil the mixture with the rind for a minute, cool to body temperature and pour it over the cooled dark chocolate mousse. Soak the gelatin in the water. Add the soaked gelatin to the cream and heat to 80 C°. Whip the egg yolks and mix with the warm gelatin-cream mixture. Melt the white chocolate to 36 C° and mix with the egg yolk-cream mixture. Cool to 27 C° and mix with the whipped cream. Heat the milk, glucose and butter to 80 C° and mix in the dark chocolate. With whipped cream and white chocolate pastilles sprinkled with ground nut brittle. Important! The texture, sweetness and solidity of the mousses is set for the amount of sugar, cocoa and fat content of the Callebaut 811NV and Velvet chocolates. Using other types of chocolates might change the taste and solidity of the mousses. The solidity of the mousses can be increased with additional cocoa butter. If you grind the nut brittle with the help of thermomix or cutter, you’ll get a smoother nut brittle layer. 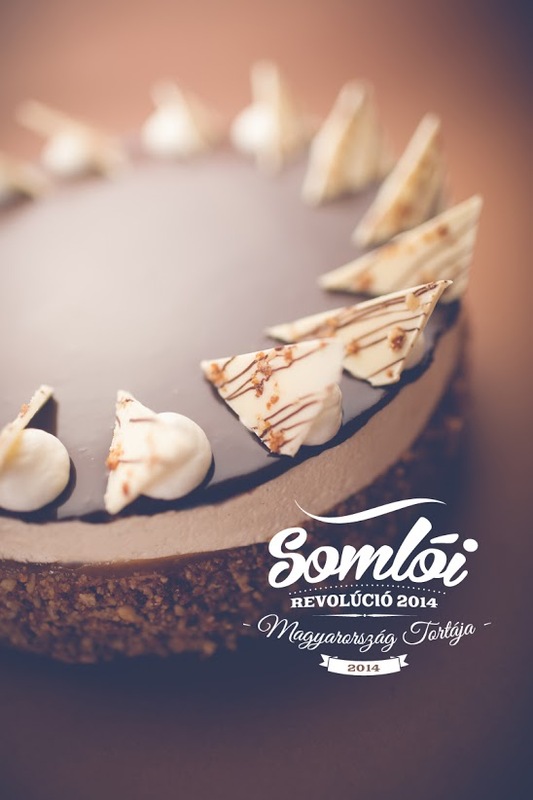 Recipe for the winner of the Sugar-Free Cake of Hungary 2014: Csokis Kaland (Chocolate-y Adventure) coming soon! What else can you say except WOW! I’d try a piece of that. For some reason I don’t think I’d be able to pull off making anything look that good.